Everyone wants the kids to have fun and carry a lasting impression that orchestras are grand and wonderful, but the thing is, being in the audience for a symphony concert by definition requires sitting very still and making no sound for an hour or more at a time. For children, having to sit so still for so long a time can actually be psychologically painful. In many households, it is used as a form of punishment. Therefore, symphony concerts and children are not the best combination. I played a lot of children’s concerts in my playing days. Some of them were very good. But I am very sorry to report that others were not. Part of the problem is, symphony orchestras just aren’t in that line of work, and the economics of orchestra concerts being what they are, there is usually little or no money in the budget to do a big custom-built visually engaging event for two thousand bussed-in school children on a Wednesday afternoon. So out of sheer financial necessity, some of the orchestras I played in would just do a one-hour version of an adult concert, with the assistant conductor giving a little lecture on some fine musicological point. The players would always just try to get through it while ignoring the buzz of distracted noise in the crowd, and everyone would just hope that the audience was somehow, despite their general lack of interest, soaking up a cultural experience. Sad to say, I was bored out of my mind at more than one kiddie concert, but I at least had something to do. I genuinely pitied the kids in the audience at some of these concerts. There was one time we were going to do a kiddie concert at the Boston Ballet. We were in the Wang Center, and so we had 5,000 high school kids in the seats. For every hundred kids there was maybe one teacher on guard duty—whatever it was, it wasn’t enough. It was during the school day, so attendance was mandatory for everyone, and for this audience we were going to perform the entire Sleeping Beauty ballet. Three hours. No lecture. No changes from the regular show. Here goes. Well, other than the usual drone of chit chat in the audience, this went along okay for the first act. But then, at intermission, someone in management decided to make a little extra money by opening the concession stand to all these kids. Not necessarily a bad idea, but the trouble was, when the audience came back for Act II, they were all armed with M&M’s. Eventually, some whiz kid in a box seat way up in the second balcony made the necessary trigonometric calculations required to land an M&M right on top of the tympani heads in the orchestra pit. With its sugar-coated mass multiplied by its gravity-induced velocity, each M&M made a very satisfying “boing” noise with every accurate hit. Once the kids had the range, they fired for effect. Down they came. Boing, boing, boing. Fortunately, the mind tends to block out truly unpleasant memories, so I don’t remember a lot of the less-than-stellar children’s concerts I played. But there is one I cannot forget—it was so traumatic I can never get it out of my mind. We were playing in one of those old, all-purpose civic-center war memorial auditoriums, better used for wrestling matches. It had a big overhanging balcony all around, and the orchestra wasn’t on the stage, we were out in the center of the floor. This meant we were completely surrounded; there was nowhere to retreat in case of a massive frontal assault. The conductor had come up with a real toe-tapping theme for this concert: it was called “Minuets Through the Ages.” (No, I am not kidding.) We proceeded to play various Haydn and Mozart minuets, and in between each one, this conductor would turn around to these 8,000 hormone-soaked seventh graders and give them a little lecture on some obscure musicological point regarding 3/4 time. Well, you would think that somehow, somewhere, somebody would have taken a look at this idea and realized that this would not hold the attention of a bunch of rowdy seventh graders for 60 minutes, but . . . they didn’t. The kids became more and more hostile as the show went on. About halfway through, we completely lost them. We could barely hear ourselves playing over the talking. And, since the kids held the high ground of the balcony, we were pretty much doomed from the get-go. Towards the end, spitballs made out of the printed programs started to come down in a blizzard. In retrospect, I consider myself lucky to have gotten out of there alive. Whenever I played a less-than-wonderful kiddie concert, it always bothered me for a more practical reason: deep in my narcissistic heart, I knew that my future livelihood as a musician was highly dependent upon effective audience development, and I hated to see opportunities to achieve that goal go to waste. One fateful day I was hired to play a concert for children that included a lot of dancing, so we figured all right, at least there’s something to look at, this should hold the kids’ attention. But alas, the story was not terribly interesting, and eventually everyone, including the orchestra, just about fell asleep. That was bad enough, but in the middle of the show (and no, I am not making this up), six little kids came out carrying a stretcher with a “body” on it. They were supposed to be the pallbearers at Mozart’s funeral. I’m all for grand dramatic effects whenever appropriate, but gee whiz . . . Mozart’s corpse? In a show designed for five year olds? I thought it was a bit much. So I went home and pondered this little gauntlet thrown down at my creativity. The challenge was to create a 60-minute show that, for budgetary reasons, could use no more than four actors. It had to use music from the standard (public domain) orchestra literature. And it had to work for all age groups—including 3, 5, 7, and 13-year olds, as well as their parents. And it had to actually teach something about music. Yikes. I thought about this for quite a while. 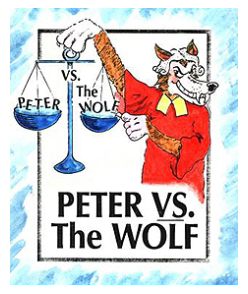 One night I was trying to come up with some kind of comedic court case based on one of the classic fairy tales, when I just blurted out the phrase, “Peter VS. the Wolf.” At last, the Wolf would have his day in court. As part of my research, I sat down with a lawyer and told him the original story of Peter and the Wolf. The first thing he said was, “Well, it’s obvious the Wolf was denied due process,” and we were off and running. The result was a courtroom comedy based on the characters and events of the original Prokofiev story. The musicians would each be called to the stand to be cross-examined by the Wolf, and all of the instruments would be demonstrated and explained in the process. This show was a remarkable success at its premiere. Amazingly, it worked for kids of all ages, and their parents. Once Peter VS. the Wolf was produced inMassachusetts, I wondered if anyone else would want to do it. And maybe pay me money for the use of it? So I sent a few flyers around. Imagine my shock when the Phoenix Symphony scheduled it! That was the beginning of a remarkable series of events. Some unknown musician who played the show in one distant city would call their cousin in another city to tell them about it, and bit by bit I started to get calls from orchestra managers from all over, asking about it and wanting to perform it. This went on for several years, until one fine day I received an email from someone in, of all places, Brazil. They told me they wished to perform my “Pedro Versus O Lobo.” They went on to say they were going to perform it in the “municipal theater” of Rio de Janeiro. Well I must admit, this didn’t sound very classy– I had this vision of the local “municipal theater” as being one of those multi-purpose facilities with kids making ash trays at one end and a basketball hoop at the other. But Rio is Rio, so I asked them, “Well, would you be willing to fly me down and put me up?” “Sure,” they said. Well, ash trays and screaming kids or no, a free trip to Rio is nothing to sneeze at, so off I went. At one point I started to wonder if this would turn out to be one of those Nigerian email scams, but I had grown up listening to Antonio Carlos Jobim and Joao Gilberto singing about girls from Ipanema, and my curiosity was too much, so I took the chance. Well . . . it turns out the “municipal theater,” better known as O Theatro Municipal do Rio de Janeiro, is more or less the Carnegie Hall of South America. The entire building was imported from Europe back at the height of the rubber boom, it was loosely copied from the Paris Opera House, and it is one of the most beautiful edifices anywhere. The sets and costumes of the production rivaled those of a Broadway show, and local heartthrob soap opera stars were cast in the leading roles. There were 12 sold-out performances, and they put me up in a five-star hotel right on the beach. Needless to say, this was a truly fabulous experience. There was only one problem: I could not shake this sense of total confusion. There I was, sitting on Ipanema Beach, with a cold coconut in one hand and a caipirinha in the other, and I could not for the life of me figure out how I got there. It made absolutely no sense. But then out of the blue, an epiphany arrived that explained it all to me, and my mind was at rest. I suddenly realized that I owed it all . . . to Mozart’s corpse. 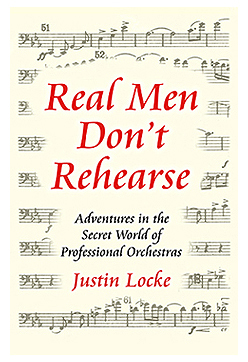 You can read the entire script of “Peter VS the Wolf” on Justin Locke’s Website. The site’s “video” page includes excerpts from the show’s Bahamas premiere. At time of this writing, the next scheduled performance is in Buffalo, NY. I enjoyed your reading your piece on disasters at Kiddie concerts. I too have had my fair share, but one I particularly remember was to be recorded by the local television station. For once the programme was good, so there had to be a disaster, and sure enough, the Toy Symphony proved to be it! I had cajoled, bullied, bribed and blackmailed some of the teachers to play the toys, but some bright spark (thank goodness for his health I never found out who!) decided to give 800 kids toys bazookas to use as trumpets! Of course, none of the kids waited for the appropriate piece, and the first ten minutes were completely drowned out by bazookas. The concert was stopped, and the offending “instruments” duly confiscated. The rest of the concert is now something of a blur in my memory!